It's hard to believe, but it's just a matter of days now before our little baby girl makes her grand appearance into this world. I think I'm as ready as I can be for this big change in our daily lives--of course when there are babies there are always surprises; Will she be a good sleeper? ; Will feedings go well? ; How will my little guy adjust to becoming a big brother? I will have the answers to all of these questions soon enough. 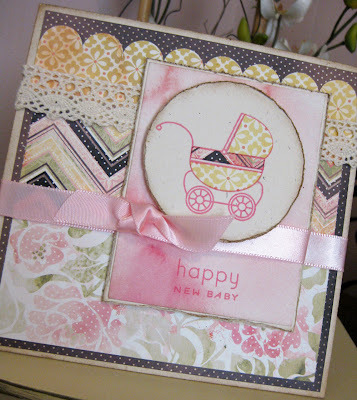 Since I've had baby on the brain I really had an urge to get out my Papertrey Ink Bitty Baby Blessings stamp set and create some adorable baby cards. I've also been hording a few paper collections that I thought would work well with the set. 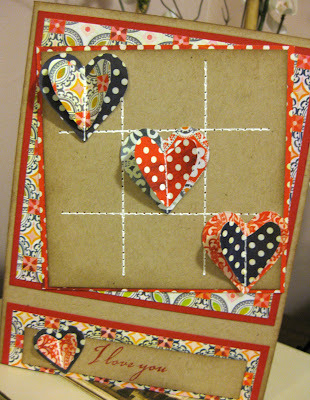 As it turns out, Betsy Veldman has put a challenge up on her blog Paper, Scissors and Superheroes featuring one of my favorite techniques; paper piecing. I knew that this particular stamp set would work well for the challenge. 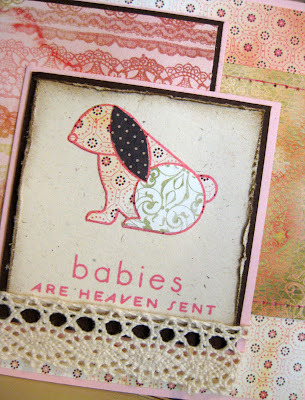 Betsy's cards are amazing, and she is definitely one of the designers that I turn to for inspiration time and time again. The things I love best about her work are the way she combines many different layers of patterns and textures into each work, her eye for detail and her amazing color combos. When you have a chance you need to pop over to her blog to see her beautiful work for yourself. I really like the way this little guy turned out, looks just like a stuffed patchwork bunny perfect for a little girl to love. I just recently picked up an adorable stuffed bunny made by Bunnies By the Bay. She's soft and pink and her name is Petal and she'll make a perfect gift for my little guy to give to his baby sister. He's so pleased with it and he told me he can't wait to give it to the baby. He's getting a brand new Geo Trax train set from his new sister-- boy is he going to love her for that! Just because I'm about to have a baby girl doesn't mean I've forgotten how precious our little baby boys are too. I love the color combination used in this Stampin' Up paper, these are the exact colors I used when I was decorating for my little guys room three years ago. I believe this particular collection was featured in Stampin' Up's 2009 Sale-A-Bration catalog. 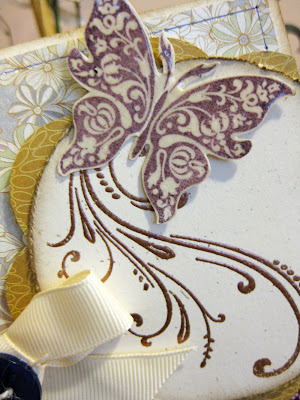 This card was made using papers from Basic Grey's Porcelain collection. I love the shabby chic feel it lends to the design and how the old fashioned Baby pram enhances that timeless feel. This card was made with my son in mind. Back then when I was a first time mother I had not yet discovered my love for paper crafting, but it's never too late to turn to the past for inspiration. When my son was a wee dumpling I used to love watching him crawl around in nothing but a onesie. His legs were so chubby and delicious! It's hard to believe he is now three and such a big boy. Oh, how I love a baby in a onesie--but we'll be back to those days soon enough. Wishing you love and chocolates for this Valentine's day. I really do love vintage--anything shabby, distressed, antiqued, nostalgic truly speaks to me. For a long time I used to clip out vintage style images from magazines or save them on my hard drive just because I loved them so much. 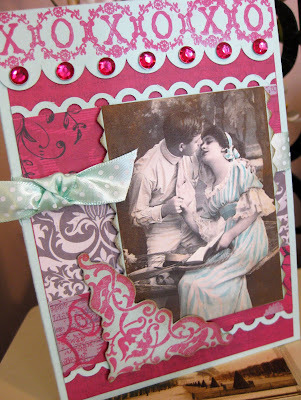 Then one day, about a year and a half ago I was suddenly struck by the idea to make my own greeting cards featuring vintage images--imagine my surprise when I soon there after discovered that there was a whole community of crafters doing the same thing! There's a famous quote from the author C.S. Lewis which is " We read to know that we are not alone", I truly believe that we create art for the very same reason. Melissa Phillips has once again picked out a beautiful inspiration piece for all of her blog readers to play along with. I just couldn't resist once again creating my own card based around this photo. One of the main reasons I love her design challenges is simply for the reason that it's not actually a contest. I think one of the reasons I've slowed down on participating in sketch challenges is because I found I was compromising my style in order to suit the challenge, and that really wasn't any fun for me. Now I know most of the time the cards I create based on the inspiration pieces are very loose interpretations, but that suites me fine. I love to see where the inspiration will take my creation and it's wonderful to know that the seed was planted by one particular image. 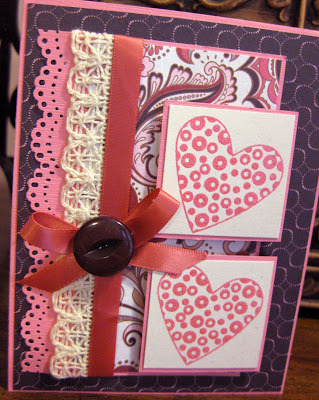 I normally love to include a sentiment on the front of my cards and leave the inside blank. Since I felt that a sentiment would over crowd the front of this card I went ahead and finished off the inside with a sentiment this time. Just one more quick pic. to share with you today. 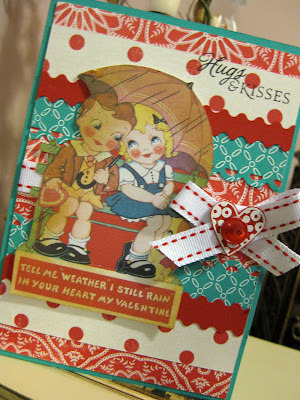 I made this final card using a vintage image that is currently being offered as a Valentine's day gift to all the readers of the Heartwarming Vintage blog. 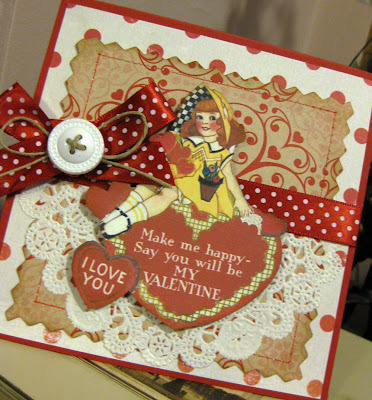 You should stop over there and pick it up, maybe even make your own vintage inspired card. 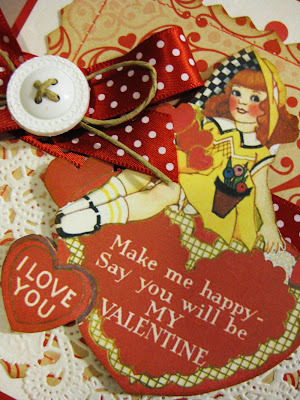 So if you do, make sure you send it in for their Love Vintage Challenge--you just might win a $25.00 gift certificate. Good luck! If you are interested in a shot at having one of your own card creations published in a magazine then check out the latest challenge over at the Caardvarks blog. They have partnered up with the amazing CARDS magazine and the winner will be featured in one of their publications. When I saw this challenge I thought why not! 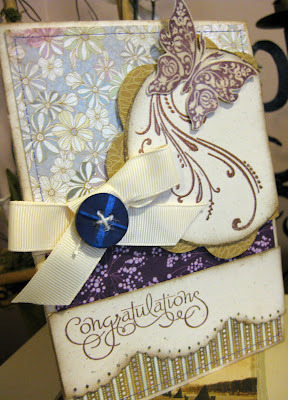 I just got this great Congratulations sentiment stamp from Stampin' Up! and I thought this challenge would be a perfect opportunity to put it to use. Also, we have a family wedding coming up in August, and I just found out our children will also be invited which means we will definitely be able to attend. 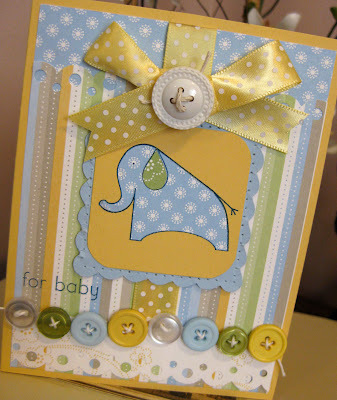 So now that our babysitting issues have been resolved I thought, great--now I can make a card! Just wanted to share a quick pic with you of yesterday's snow fall. I stuck my head out of our side door to get this picture and that's about as close as I got to the snow. At nine months pregnant I know that my big belly and the slippery side walk should never be introduced. 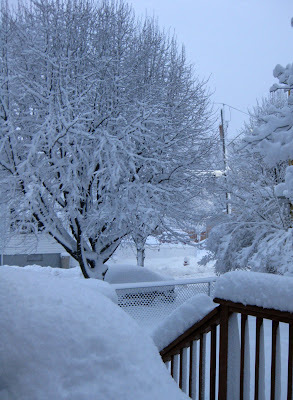 But I must say, as messy as the snow is and will be for the days to come it certainly was a beautiful snow fall. Are you ready for Valentine's Day? 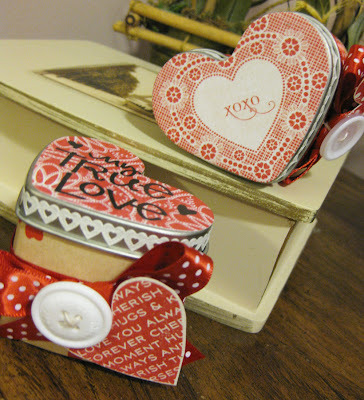 I am now, after finishing up a few cards last night for my nearest and dearests and putting together some adorable heart tins filled with chocolates for my hubby and little guy--I'll share those with you soon. 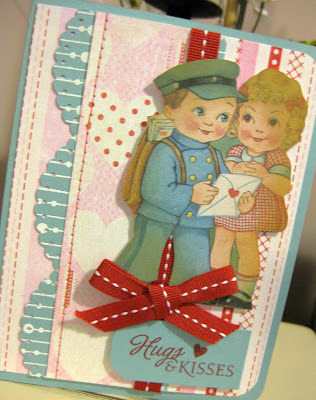 I just wanted to share with you today a pair of adorable cards featuring two very cute couples. Again, I hit up Flickr's photo streams to find these two amazing vintage Valentine images. I just love the resources for crafting that Flickr provides, my collection of favorites is forever growing. For those of you reading this who are on the East coast I hope you cozy up today in doors and enjoy a relaxing snow day. My hubby will be staying home today too, which I'm grateful for. I'm in no position, with less than two weeks to go until baby arrives, to battle a snow storm or a three year old crying to go out and play on my own. 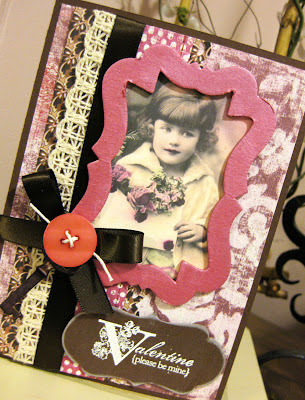 Yet another fabulous piece of inspiration from the Moxie Fab World blog. This one was a bit tougher for me to wrap my head around, but once I decided on using papers from Basic Grey's June Bug collection my design quickly fell into place. I've been hoarding these papers for way too long and have been dying to use them on a project. 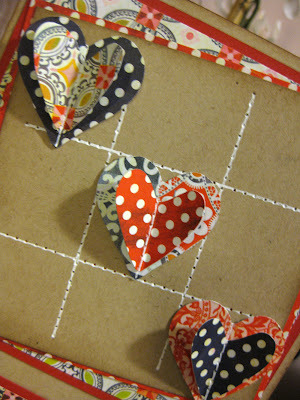 They are such a mix of fun and quirky patterns and colors, perfect for any patch-work inspired piece. 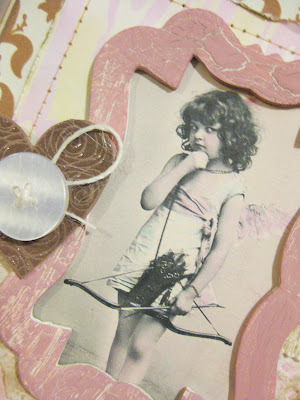 I mentioned a few blog posts ago how I love to use found objects to create my own embellishments for my cards. There are definitely an assortment of amazing products out there to use, and I have, but there is definitely something very satisfying and fun to flexing your creative muscle and coming up with your own. 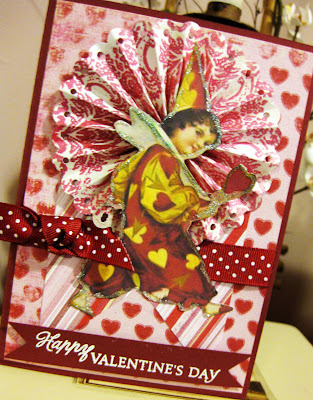 The first card I would like to share was made with mainly papers and embellishments from K & Company's Madeline Collection. 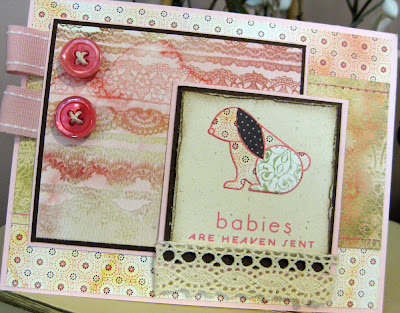 I just love the shabby chic feel to this line and how it all comes together on this card. 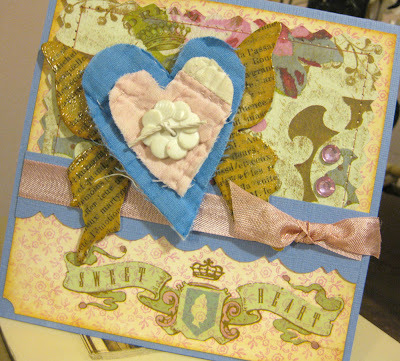 This adorable heart with butterfly wings really lends to the shabby chic appeal of this card and it was so much fun to make! The wings are made of chip board which I covered with a page from a vintage French book using Modge Podge. After the Modge Podge dried I distressed the pages a bit further using Ranger's distress inks and then I applied a layer of clear embossing powder to add a bit of shine. 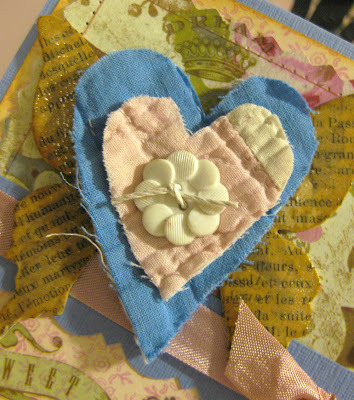 I then layered two material hearts and a vintage button and attached them to the wings. The hearts, button and pink seam binding were all Etsy finds, such a wonderful source for unique and interesting materials for all of your crafting needs. This second card was made with papers from Making Memories, ribbon from Stampin' Up and a piece of black damask paper that I found via an Internet source over a year ago. I have it saved as a digital file on my computer and whenever I need a great piece of damask it's ready and waiting to be printed out and used. 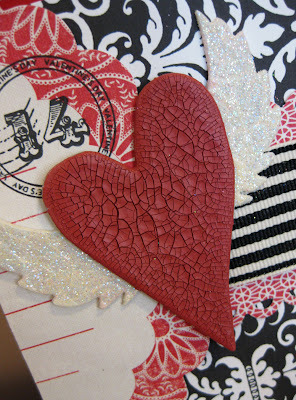 This heart embellishment was made using Tim Holtz's Grunge board which I then painted with Ranger's distress crackle paint in brick. I love the way this paint dries. The thicker the coat you apply the more cracks appear. The wings, also grunge board, were first painted with a cream colored acrylic paint and then glitter was applied with heat and stick powder. 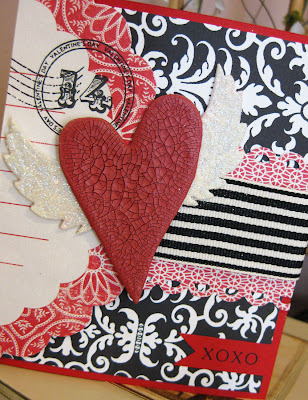 I have to say that I really like the way this sweet little winged heart pops out against the black, red and white background. It is so hard to believe that it's the 1st of February. ; just two weeks until Valentine's day and any day now until the newest addition to our family will be making her grand entrance into the world. So many things to be grateful and excited for. 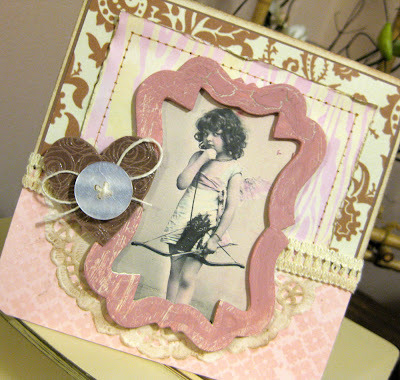 I just wanted to share with you yet another card created from a scrumptious piece of inspiration provided by Melissa Phillips' via her blog LilyBean's Paperie. 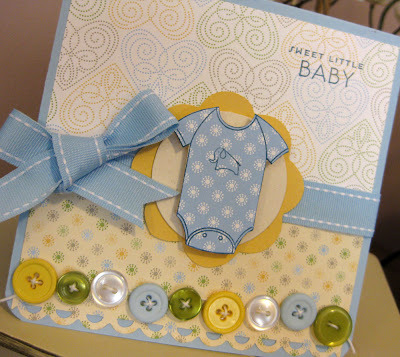 This is the second such design inspiration that Melissa has offered her blog followers. Although I did create a card for her last challenge, for some reason my link never showed up on her blog. If you'd like to take a peak at that last one here's the link for you; An Eclectic Bit of Inspiration . When I first saw this week's inspiration photo I thought red, white and kraft and I knew I had just the right Valentine's day card. How perfect does this paper line from Making Memories coordinate with those requirements? Although this collection is from last year, it's new to me and I had such fun creating with it. 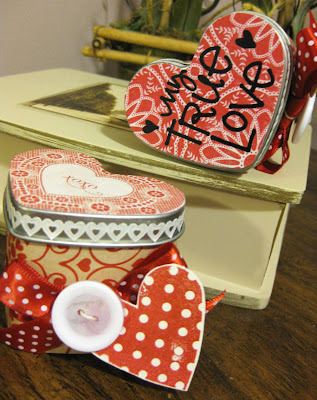 In fact, I think it was my favorite for V-day crafting--so simple, but classic and versatile. Also, just one more vintage die cut image that I couldn't resist. 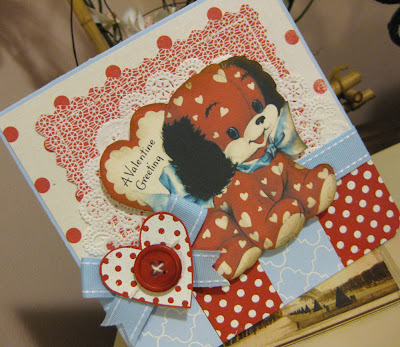 And how adorable does this little red-head look sitting up top of that Valentine heart and lace doily--just precious.